With Sea Chaser, details are important, which is why each of their boats provide ample storage space for all of the family’s carry-ons, hull-side rod racks feature angled receptacles and each Sea Chaser is plumbed with a quality baitwell. All Sea Chaser boats are NMMA Certified and adhering to the highest standards. 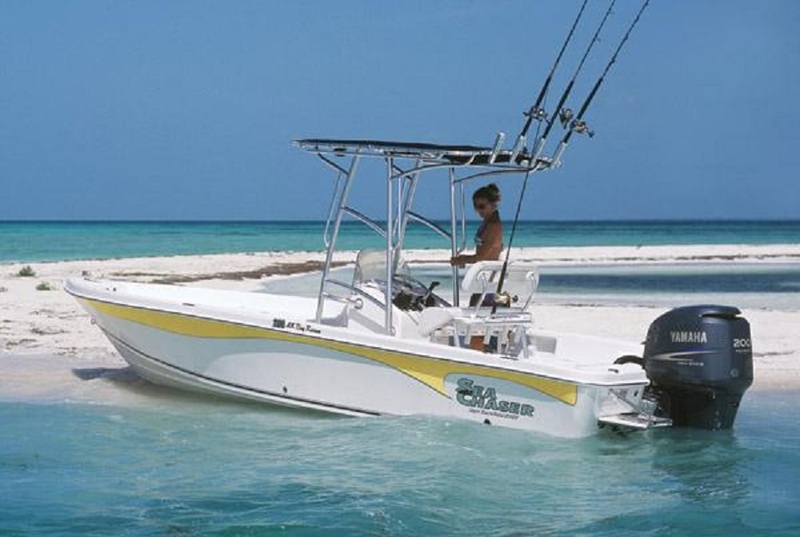 Gulf Marine is an authorized retailer and service center for Sea Chaser marine products. Give us a call with any questions or for any assistance. The Sea Skiff line brings all the elements of boating together; durability, versatility, and affordability, combined with our construction and quality finish delivers the most for your money. The “Sea Skiff” comes standard with plentiful storage to allow you to tuck away gear leaving the cockpit area free for fishing and fun. The “Sea Skiff” offers many great features and functionality for pleasure boating, fishing or work. Offered in the 19' and 21' length. The LX Series can be used as a general- purpose boat for bays, rivers, lakes and even venture offshore. Constructed using 100% composite materials, a 103” beam and respectable gunwale height, the LX series is a great all around boat. Loaded with standard features like, twin forward locking rod storage boxes, locking fiberglass hatches, gunwale rod storage with combing boards, stainless steel folding cleats, storage locker with five gallon cast net bucket, console bait-well, stainless steel low profile bow and stern handrail, hydraulic steering, rear jump seats, stainless steel blue LED lit cup holders, underwater LED lighting, patented rub rail LED navigation lights, a quick release windshield and a whole lot more. Offered in the 21', 23' and 26' length. The all new Hybrid Fish & Cruise (HFC). A truly revolutionary design that is built from the ground up with devoted fishermen and active families in mind. This multi-functional boat comes with more standard features than you can imagine including heavy duty, stainless steel fold down cleats, LED lighting under gunwell, stainless steel anchor chock, windless ready anchor storage, in floor fully insulated lockable fish box, built in lifting eye, illuminated stainless steel LED cup holders, tilt steering wheel, and digital command link plus just to name a few. Offered in the 20', 22', 24', and 27' length. The Sea Chaser Flat Series boats are designed specifically for fishing in these circumstances, drawing as little as 7 inches of water. But the shallow draft is just one reason that make them great fishing boats. Standard features include an insulated bait well with Maxi-Air aerator system to keep your bait fresh on the way out, and an insulated fish box to keep your catch cold all the way back home. Two lockable rod storage boxes and built in tackle coxes with pull-out trays. Standard trolling motor panel and push pole holders. Options include a hydraulic jack plate and an additional forward-deck aerated livewell. In short, the standard features are great and you are welcome to customize it even more. Offered in the 16', 18', and 20' length.